Funky16Corners is by far the best soul site I know, but I also have a subscription to Galactic Fractures. It is a radio show by a man named P.J., that is also available as a podcast. There are about 100 shows on his site that you can listen to, and if you like old school soul, I think you will enjoy this music very much. He also has some guest deejays doing a show for him, like Johnny Paycheck, who played some great reggae-got-soul records. And Mr. Funky16Corners, Larry Grogan, did an hour too, which you shouldn’t miss. 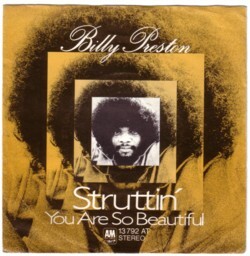 Here is Struttin’ , from a 45 by Billy Preston, that I bought recently. This the sort of tunes you can hear on Galactic Fractures!